You know the kind of interjection that one might insert into a narrative, bringing in a completely new angle on the story that is unfolding? Well, just when we were getting into the groove of this pause in our “real” lives, just while we were savoring leisurely days of sun and aqua waters while cruising the Bahamas, enjoying a growing confidence in our sailing abilities, just while we were finding pleasure in a slower, simpler pace of our day-to-day rhythms, life interjected. Tim and I were sailing in the Abacos from Green Turtle to No Name Cay, when half a world away, a careless driver’s swerve on a Vancouver bridge interjected. The alarming phone call that followed abruptly interrupted our story. Ours were not the only lives interrupted, and really, our interruption was a minor one. As we shared in our last Ariose Note, my youngest son Marcus, while cycling back to his apartment from university, was struck in a hit and run. A split second incident and his life has been radically interrupted. His art student, rock climber, social activist, skateboarder, skier status was instantly exchanged for a role with full time responsibility for his recovery. He’s shown himself to be remarkably adept at this new role, but I’m getting ahead of myself. Two very special people, my daughter Rachelle and Marcus’ friend Julia, paused their lives to be at his side night and day offering amazing advocacy and support. A far-reaching network of family and friends have also been affected by worry (and their many, many well wishes have meant more than I can say). We can only imagine how unsettling it likely was for witnesses to the accident, especially the special person who was first on the scene. Last, but not least, we hope that the driver’s life has also been altered. Perhaps that person’s conscience is triggering remorse-filled nights that will lead to coming forward. Anyways, all those stories are not ours to tell. Back to the boat. Flying over Ariose among the boats in Marsh Harbour. The morning after the phone call, I was able to book a flight to Vancouver departing in a few days’ time. Tim & I had a day’s sail to get to Marsh Harbour on Great Abaco Island where the airport is. That involved a passage out to the Atlantic through Whale Cay Cut which can be treacherous in unfavourable winds. I wanted the weather insurance brought by a couple day window. In ends up, conditions were fine the very next morning, so I faced a couple of days – excruciatingly lonnggg days – of waiting for my flight. Every fibre of my being longed to be with Marcus. Then came a head-spinning StarTrek-ish experience. Beam me up, er, over, Scottie! At 8am Eastern Standard Time, Tim and I had breakfast together on Ariose. We then rowed Poco to shore and hiked a few miles in the mid-20 degree Celcius sun to the Marsh Harbour airport. I flew to Vancouver with 2 quick connections, and by midnight Pacific Time, found myself stepping off the Skytrain, walking a few blocks carrying the dual weight of my pack and heavy jet lag in the freshness of the 3 degree C air. I was let into Marcus’ apartment by one of his caring roommates, and tiptoed up the stairs to give him a kiss, carefully avoiding the wounds. I had been transported to another world. It all felt bizarre but I was so relieved to be there. Tim and I originally set out from North Bay on our adventure late October, and 3 months later, we had arrived in the Bahamas, leaving about 2000 km in our wake. On this journey, in less than 20 hours, I had been transported over 6000 km from the Bahamas to Vancouver. Staggering. It was precious to be with Marcus. It’s been many years since we’ve had time to just be together, without the pressure of having a limited holiday visit with one another, or without the distraction of others around. We spent some of our time together in simple conversation and catching up, or just listening to interesting podcasts together in Marcus’ darkened room. Some of our time was spent in more meaningful reflection. I, fortunately, have never before had to go through any serious crises involving my children, nor has Marcus had any direct brushes with his mortality. Naturally, there was much to process. Marcus has never been the typical young male who sees himself as invincible, though – sadly, he has known the loss of others near him in age, others, such as Carter A, whose life was cut tragically short. (As an aside, a few years ago, as part of a group of volunteers, I worked with Carter’s parents to galvanize the community support to create an amazing skatepark in his memory.) I’ve replayed the seriousness of Marcus’ many injuries so many times, finding it astonishing that he’s not more incapacitated than he is. Among other injuries, he fractured 9 vertebrae, yet his spinal cord is unaffected. Near the end of our 2 weeks together, Marcus shared with me that when he was struck, he was wearing his favourite backpack. That backpack is one that Carter’s parents gave to Marcus following Carter’s passing. It had contained Carter’s avalanche safety gear and they wanted Marcus to benefit from it when backcountry skiing. I was moved to tears. How fitting that Marcus’ ability to hit the slopes again someday was protected, perhaps, by Carter’s backpack. … a set of clippers, can make! Marcus has a long road ahead in his recovery, but I’ve never felt more confident about his abilities than I do now. Within a week of the accident, he was beginning to create an artpiece using the shirt the paramedics cut off him as his canvas. His body is also healing well, “one of the most remarkable cases I’ve seen” in the words of one of his physicians at a follow-up appointment. He’s wisely resting his brain to allow it to recover from the concussion. Even should he continue to be affected in the years to come, he’s shown such resiliency, I know he won’t be held back. He has an all-encompassing team working with him on the rehab and legal aspects, and most importantly, he is surrounded by many friends and family who love him. He will be just fine. Perhaps the most meaningful silver lining of this interjection was the effect on our family. I felt a closeness emerge that doesn’t always show in the busyness of our separate lives that are spread so far across the country. Now, in case my kids are reading this and hatching ideas for some further family bonding, let’s just plan a holiday together. We don’t need anything like this to trigger closeness ever again. There were some other silver linings to my time in Vancouver. I wasn’t feeling as though I needed a break from Ariose, but it sure was good to be on the ground again. Being able to step out the door and go for a walk is a key part of my usual routine that I have missed in sailing. There is also an ease in land life that doesn’t exist on board, especially on a small boat like Ariose. Who knew that doing dishes in a large sink with unlimited warm water without having to brace yourself while doing them could be such a pleasurable activity? And showers? Every day? Long ones? That felt like an obscene waste but an appreciated luxury nonetheless. 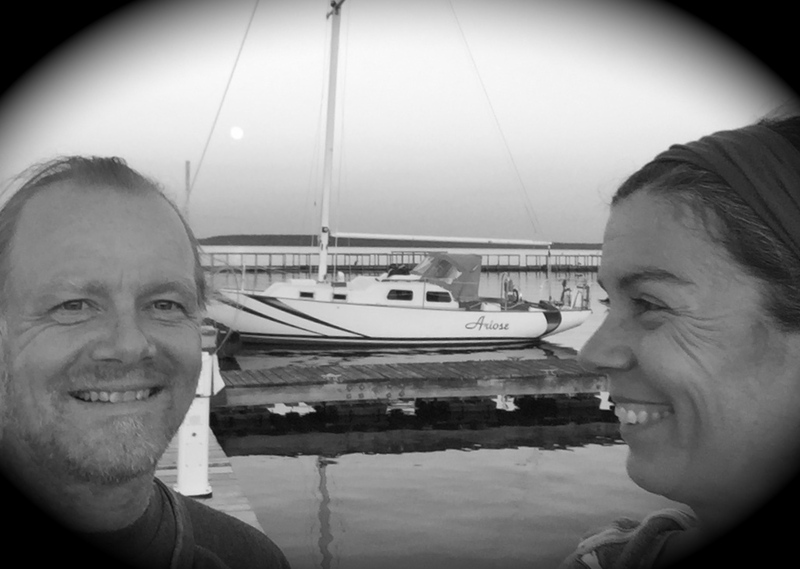 It was good going to bed every night with a state of relaxation that just doesn’t come for us when we are on the water, knowing that we need to be prepared to jump into gear at any time to deal with an anchor dragging, or other unexpected events that could (and do) arise. While at Marcus’ side during his initial healing, I got a chance to unearth all those mothering skills that haven’t been used in ages. It was with gusto that I hiked a few blocks to tackle laundry (bloodstains and all! ), did the shopping, cleaning, cooking, and yes, even monumental tasks like helping Marcus don his socks. I also got to dust off some long dormant clinical occupational therapist skills during our time together. Day by day, Marcus passed such functional tests as putting his own shoes on and feeding himself (& me too!). His shuffle from bedroom to kitchen advanced to a snail’s pace walk to the corner and back. He managed to cautiously use public transit on his own, which proved to be far more emotionally taxing for me than him. I felt a fierce protective urge that was reminiscent of the mother bear instinct I felt when bringing him home from hospital as a newborn. I had wanted to encase him in bubble wrap or at least have him wear a blazing “I have a broken back & bruised brain” banner before going out into that rough world. For some reason he declined my suggestions, and did manage fine. Before long, he was spending more and more time each day engaging with friends and I knew it was time for me to go. I helped him set up the follow-up care he needs, then after our 15 days together, vacated his couch to let him reclaim his life as I returned to Tim on Ariose. Knowing that Marcus has the love and support of Julia, his room-mates, and a wide network of exceptionally caring friends (and Chili, the cat), made it far easier for me to do so. And less than 24 hours later, back “home”. So back again to the Bahamas, and this time, it felt slightly, only slightly, less surreal. On the return journey, Marcus walked me (slowly) to the skytrain station, although I must mention that he refused to carry my backpack. I was off to the airport and an overnight flight across the continent, followed by a puddle-jumper to Marsh Harbour. I have no word to describe that experience of heading to Vancouver and returning – maybe a fusion of culture shock / time warp / lifestyle exchange / environment dislocation, or something of that sort may describe it. The tropical smells and my first glimpse of the water upon my return actually felt like I was home. A cab ride then short ferry crossing brought me right to where Ariose was docked and Tim awaited. It was lovely to be together again. Had I not been in a major state of sleep deprivation, it would have felt glorious to be back. Filled with gratitude, we set sail again. It took me a full 24 hours to feel my sea legs again – I kept losing my balance as I made my way about on the deck and in the cabin. Upon arriving in Vancouver, on the other hand, my bed/Marcus’ couch had felt like it was rolling beneath me throughout that first night. Fascinating isn’t it, how our brains work. I’m not sure if I should be relieved or concerned that it only takes mine about a day to clue in to its surroundings! People have been asking how the solo sailor fared. Tim stayed a couple of days in Marsh Harbour upon my departure. There was a bit of a tense situation there, but for the sake of our relationship, perhaps it would be best for me to stay silent on that incident. He may recount that in a future Ariose Note someday. He then sailed the short hop across the Sea of Abaco to Great Guana Cay. In advance of several days of forecasted heavy winds, Tim brought Ariose north out through Whale Cay passage into the Atlantic, then back to Black Sound of Green Turtle Cay. He hunkered down there where we had stayed previously, busying himself over the 4 days of 50 km winds adjusting dock lines, removing nails from the decrepit dock that were threatening Ariose, and generally keeping things secure. There were a couple of minor losses, however. A beach towel, some line, and an anchor ball are our contributions to the rest of the jetsom littering the islands’ shores. There are also a few more minor character marks on Ariose. Tim even tackled some items on the repair list and gave Ariose a thorough cleaning that she was overdue for, AND if that wasn’t enough, had baked a batch of brownies to welcome me “home”. So, I would say, all ‘n all, he did just fine! I have noticed, however, a little more white in that beard than when I left. That, and a certain air of elevated self-assurance when at the helm. Back to the notion of interjection. Tim and I had a narrative underway as we were on our cruising adventure. Most interjections are powerfully emotive, and this one has been no exception. Although I do not want anyone I love to ever suffer through what Marcus has, I am grateful for the new perspectives and opportunities brought by this sudden interruption that was thrust upon us. We look forward to the day when Marcus will be able to resume his studies and all the activities that give him pleasure and me grey hair. Yesterday, after a heavy downpour on the Sea of Abaco, Tim and I looked out from the security our anchorage to see a spectacular rainbow. We look forward to the many (metaphorical) pots of gold to come. PS – Happy 27th Birthday to my other cycling son, Adrian.